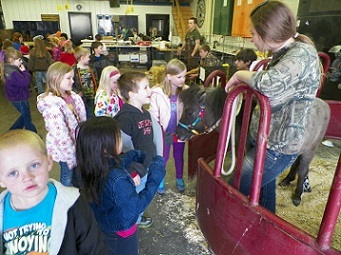 On April 8, 2013 the South Central FFA held their annual petting zoo. The chapter invited the kindergarten through fourth grade classes over to enjoy the petting zoo. Mickala Brusacorum brought in a miniature horse named Bolt. Amy Gannett brought in a horse named Red. Summer Long brought her rabbit, Resee and her dog, Oreo. Isaiah Adams brought a chicken as did Terry Copsey. Rebeka Mikalacki brought her dog, Taz. Bryce Leber brought in a beef calf named Patrick and Jeremiah Adams brought his dairy calf named Sir Loin. Shelby Toller brought in a rabbit named Cocoa. Special thanks to those who helped and to the teachers for bringing their classes over to the petting zoo.Special thanks to those who helped and to the teachers for bringing their classes over to the petting zoo.